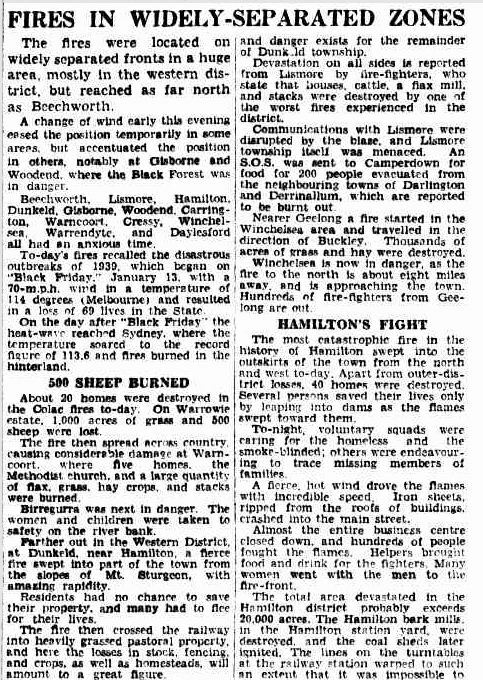 From Saturday 15 January 1944, Victorians were counting the cost of disastrous bushfires that burned out of control a day earlier, Friday 14 January 1944. 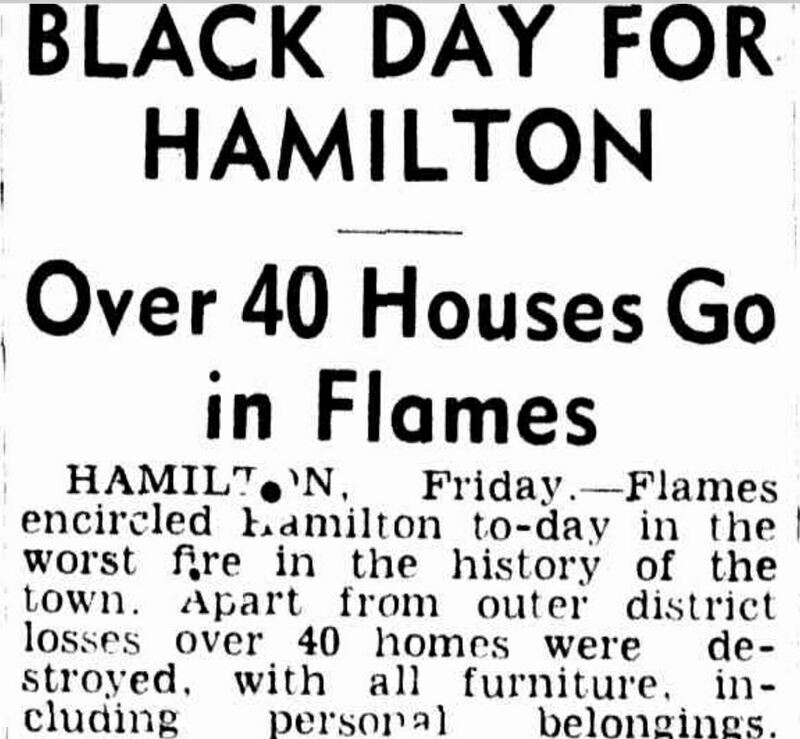 In Hamilton, the losses were particularly heavy in what were and remain, the worst fires in the history of the town with fifty homes destroyed. “BLACK DAY FOR HAMILTON” The Age (Melbourne, Vic. : 1854 – 1954) 15 January 1944: <http://nla.gov.au/nla.news-article206785522&gt;. There was some warning. December had recorded below average rainfall and the temperatures were very high over Christmas and New Year. The weekend prior had been hot with temperatures around forty degrees. Friday 14 December and Saturday 15 December were both declared days of total fire ban across the state except the Mallee. “BUSH FIRE DANGER” Portland Guardian (Vic. : 1876 – 1953) 13 January 1944: 4 (EVENING). <http://nla.gov.au/nla.news-article64387965&gt;. The Hamilton Hospital admitted more than forty people and some later died. 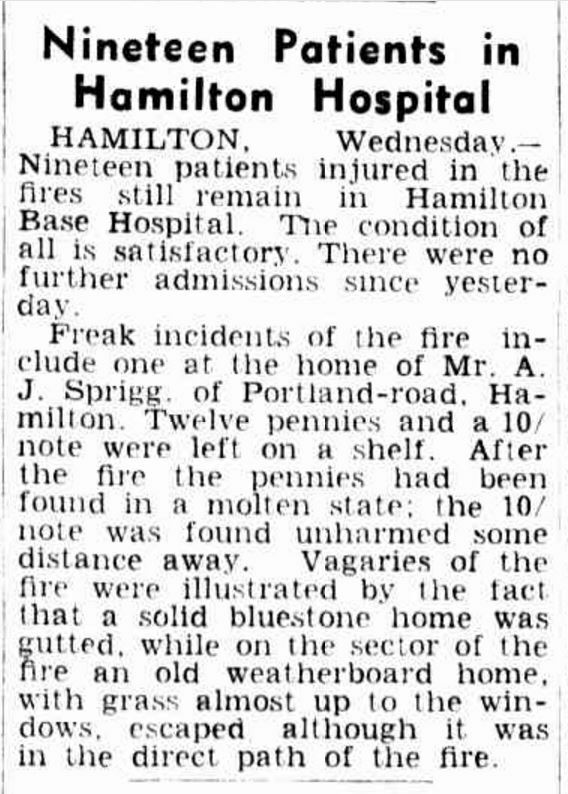 “Nineteen Patients in Hamilton Hospital” The Age (Melbourne, Vic. : 1854 – 1954) 20 January 1944: <http://nla.gov.au/nla.news-article206793515&gt;. The Lovell’s house was around three kilometres from the main street, Gray Street. The Argus reported the closest the fire got to Gray Street was just 500-800 metres from the Post Office. Having lived in Hamilton, I find this unimaginable, particularly the thought of roofing iron blowing into the main street. Another of my family members to lose a home was Mrs E.Diwell. That was Louisa Spender, wife of Ernest Diwell, a son of my gg grandparents Richard and Elizabeth Diwell. Ernest passed away in 1939 and Louisa remained at their home, described as “off ” Penshurst Road” on the 1942 Australian Electoral Roll. They actually lived to the southern end of Rippon Road which could be described as “off” Penshurst road. Penshurst Road is to the east of Hamilton and not far from where I used to live. Something to consider is this was wartime with many men serving overseas. With limited manpower, it was not surprising women were fighting side by side with men. I mentioned the fire to Nana and while she did recall it, she had no other knowledge of it. She was living Melbourne then and working at the Munitions factory at Maribyrnong prior to her marriage in 1945. Also, her immediate family lived on the northern side of the town which does not seem to have been in the path of the fire. When I mentioned women fought the fires, she gave me a, “Of course!” type of reply. 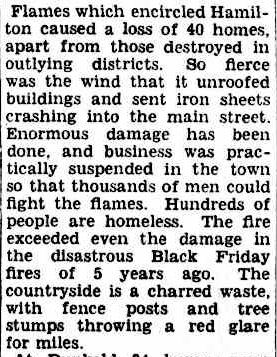 Hamilton was not the only town ravaged by the fires of January 1944. 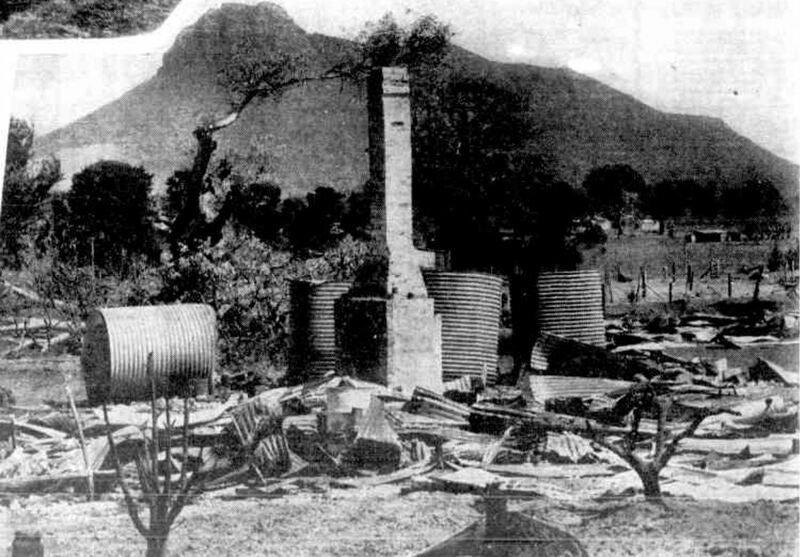 Nearby Dunkeld (below) lost more than forty homes and buildings, and twenty homes were lost at Colac. THE SCENE AT DUNKELD. “Bush Fire Victims Carry On” Weekly Times (Melbourne, Vic. : 1869 – 1954) 26 January 1944: <http://nla.gov.au/nla.news-article224839776&gt;. 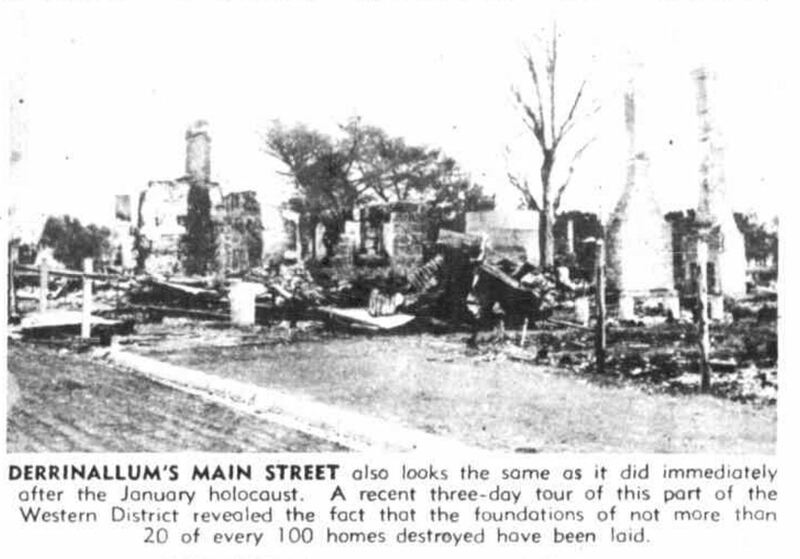 Derrinallum (below) was hit by what The Australasian described as the “January Holocaust”. 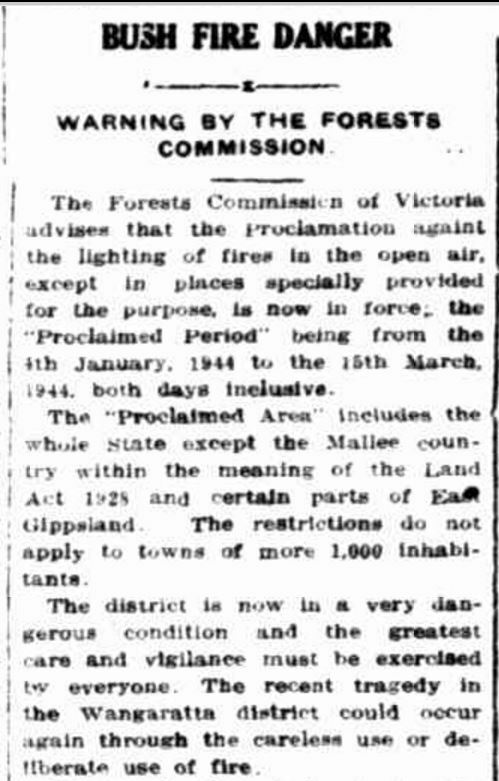 “WESTERN DISTRICT FIRE AREAS STILL SCENE OF RUIN” The Australasian (Melbourne, Vic. : 1864 – 1946) 27 May 1944: 6. Web. 14 Jan 2017 <http://nla.gov.au/nla.news-article142418919&gt;. The following article from The Sydney Morning Herald summarised the day of Friday 14 January 1944. Even beachside suburbs of Melbourne had fire running through the ti-tree, forcing hundreds on to the beaches. 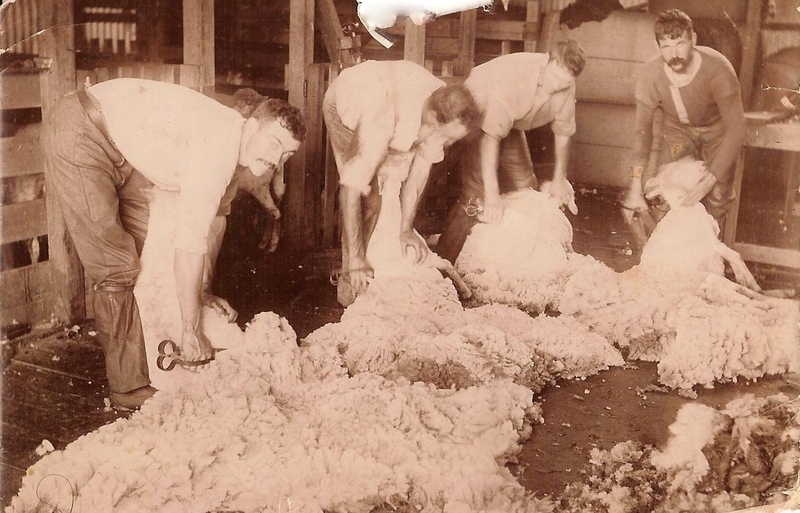 This entry was posted in In The News, Western District History and tagged Diwell, Hamilton. Bookmark the permalink.